I love Chrome, but there is a powerful rival here, this browser is faster than Chrome and the most important for me is it's free from pop-up advertising. 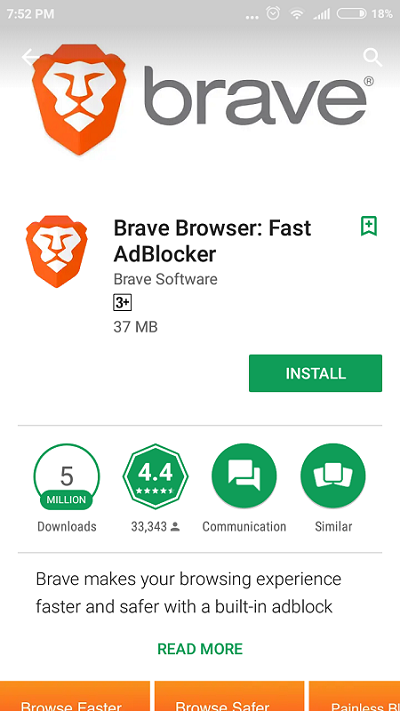 The brave browser has built-in pop-up blocker so you will not see any pop-up. When I try this browser I feel the speed is the faster than any other mobile browser I ever tried. Can you see the stats here Brave received 4.4 stars out of 5 from 33,343 people. Compared to Chrome that already has 1 billion downloads and 9 million reviews, so still, not many people know this mobile browser. There is some website that cannot display properly, but I believed for most of the people this is great mobile browser.